A voluntary opt-in system still exists in Northern Ireland while the Scottish Parliament is this week considering its own opt-out scheme. Government ministers argue the change in the rules in England could save up to 700 lives a year by increasing the number of organs available. Keira Ball, from Devon, was nine when she was involved in a car accident with her mum and brother. Image caption Keira's organs helped save four lives. Her father Joe was approached by the organ donor consent team after doctors in Bristol confirmed they could not save her life. He told the BBC: "Although we'd never discussed organ donation, I knew it was what Keira would have wanted - it was in her nature." 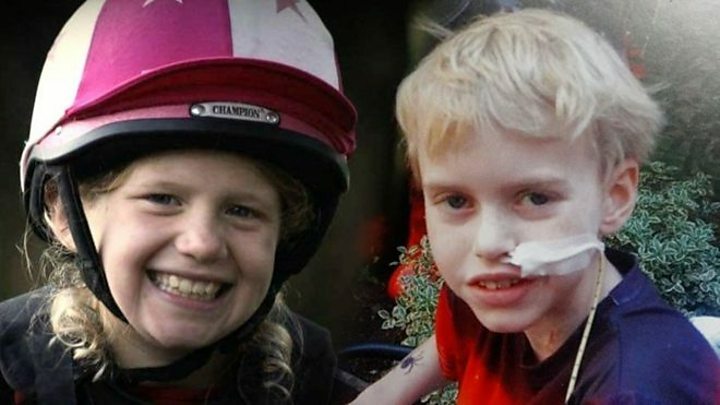 Keira's organs were used to save four lives, among them Max Johnson, then also aged nine, who received her heart. At the time of Keira's accident, Max was in hospital in Newcastle with heart failure following a viral infection. He was being kept alive with a mechanical pump. He told the BBC: "To be honest I was ready to die - I didn't think I would make it. I hugged Mum and Dad thinking this was the last hug with my parents." The operation was a success and Max, now 11, is doing well, although the anti-rejection drugs he must take every day sometimes make him quite poorly. Max's story prompted the prime minister to pledge to introduce presumed consent for organ donation in England. There are currently around 6,000 people on the transplant waiting list in the UK and last year more than 400 patients died while waiting for a suitable organ. Under the new system, people will be encouraged to register their consent for organ donation, or to opt out. It will still be open to relatives to block a donation, so it will be important that families discuss their wishes. Max and Keira's families both back public education campaigns. Loanna Ball, Keira's mum, told the BBC: "If this issue was raised in school from a young age, children would happily talk about it with their friends and family; it would be an everyday conversation." The family has set up a charity in memory of their daughter to offer support to bereaved families. Max said: "I want everyone to talk to each other - if a member of your family died, would you let their organs go to waste and decay or save a few people's lives?" The new legislation was a Private Members' Bill, introduced by Geoffrey Robinson MP. It was piloted through the House of Lords by Lord Hunt, who told the BBC he was "absolutely delighted" the Bill was on course to pass into law, adding: "I am convinced that as a result, many more organs will be donated and lives saved as a consequence."